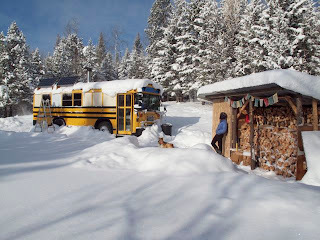 Our attraction to living a mobile-life on our school bus came in large part from our desire to explore homesteading. I will talk more about that a little later, but first let's try and pin down where homesteading comes from and what it means today. Homestead is a word that is once again gaining popularity. The term originates from the first US Federal Homestead Act created in 1862 under President Lincoln which allowed pioneers to claim land and set up home sites at little or no cost. The idea of homesteading was later embraced by the Back-to-the-land movement of the 1960's and 1970's. This faction was led by individuals and groups of people who were feeling discontented by certain aspects of city life. 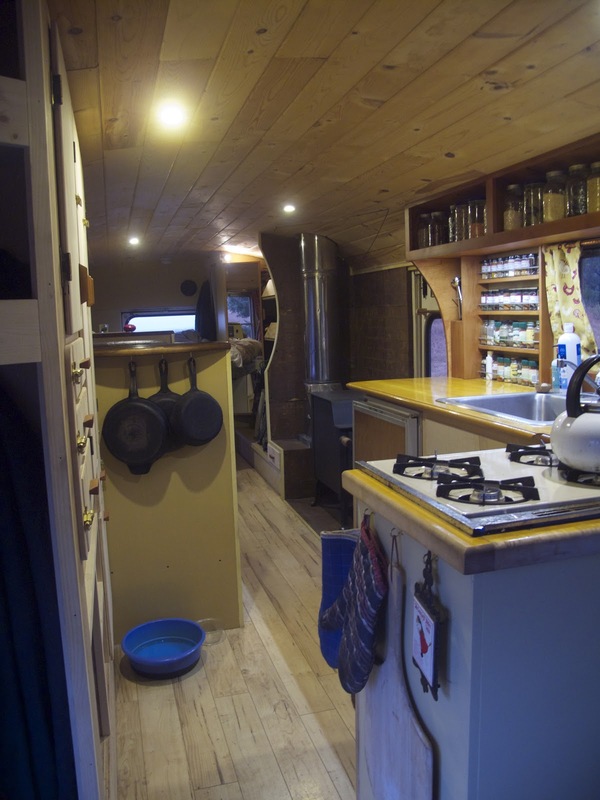 They left their urban areas seeking to live closer to nature in a more self-sufficient way while embracing the tools and farming techniques of the original homesteaders. Today, we are witnessing another rebirth of homesteading. The definition is a bit harder to pin down this time as it covers many different lifestyles in many different settings. Urban Homesteading, for example, brings agriculture and self-sufficiency back to the cities. Rural homesteading today often incorporates modern technologies such as solar, wind or hydro-electric power generation. There is a common thread among them all however, which is a movement in the direction of self-reliance. In other words, living in a manner that make you less dependent on our societies infrastructure and more dependent on your own knowledge and skills. On the premise that homesteading is a flexible term, I would like to tell you what it means to us. For me, homesteading aspirations have been in the works since before I had any idea what they were. As a small child (as far back as I can remember really) I recall trips to visit my aunt and uncle's house in Maine. Trips to see Elaine and David were always highly anticipated because they were like taking a trip back in time. Carved out of the dense woods in rural Maine, the property had been cleared enough to build a small pentagonal house, a cabin which served as the kid's room, a shed and out-house, a chicken coop, an orchard and a garden. Although I don't remember the lack of electricity or indoor plumbing, they were not there in the beginning. I do, however, remember some relics of that time. There was a working hand pump which drew clean drinking water from the underground spring. Spillover from the spring pooled into a small pond that begged countless hours of frog catching. Inside, sitting stoutly near the back edge of the softly lit one-room home, was a wood-fired cook stove kindly sharing its warmth and emitting aromatic clouds from the home-grown feast within. For several years Elaine and David raised a flock of roosters from chicks. When they had reached maturity, my family would load up the mini van and make the pilgrimage from Vermont for the annual chicken slaughter. Although at the time I wanted nothing to do with the carnage, acknowledging the process and, even more so, tasting the incredible flavor of one of those roasted birds had a lasting impression on me. Fast forward twenty years or so. I am living in Portland Oregon with Heidi, my girlfriend since collage and soon to be wife. She's working on getting through grad school and I am just plain working. At this time we were both thinking a lot about our future together. Portland had been growing exponentially (and still is) as one of the nations leaders in the farm to table movement. Farmers markets were easily accessible and reasonably priced. Restaurants were featuring menus overflowing with locally grown veggies and high quality meats from small farms just outside of the city limits. Stores were beginning to spring up that catered specifically to the "Urban Homesteader". There was a buzz around town and it all came back to the glorious piles of locally grown, vine ripened, feel good food. If there is one thing to be said about Heidi and me, it is that the two of us, unconditionally and with a fervent passion, love good food. Portland opened us up to a new world of foodie culture. We had always known that food made from scratch was better and that food from the garden was best. We were both fortunate to have families that supported both. We pursued these endeavors by gardening and expanding our cooking skills. The results were delicious. More than anything though, we enjoyed the satisfaction of doing things for ourselves. I think that the epiphany came with our first subscription to Mother Earth News. Paging through each issue of a magazine that caterers specifically to modern homesteaders, it felt like every article was written for us. We wanted to try it all! 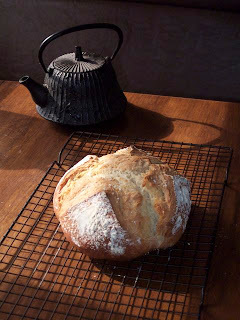 Baking bread was one of our first homesteading skills. So we knew we wanted to pursue homesteading in some form, but where and more importantly how? Enter the Mobile Homestead. We know that one day we would like to put our roots down (both literally and figuratively) in a more permanent way. We'd like to have some land to invest in and work with. A place to grow a family. We aren't ready for those things though. There is so much to learn first. There is money to save. There is the little detail of finding the right place with all of the right elements. So why not travel around? 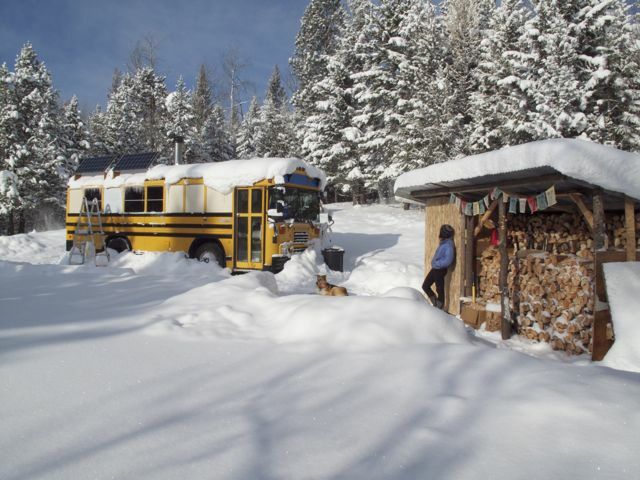 This was our inspiration to live on a school bus (Learn more here). Why not learn from those who are already doing it and simultaneously surveying different kinds of land and communities along the way? This is exactly what we aim to do. While we are living this mobile life we want to practice our new skills and live as close to our ideals as possible. We can't easily have livestock or plan on tilling the same garden every season while we are on the road. Nonetheless, we can help others with their morning chores, plantings and harvests along the way. There are also loads of homestead skills we can practice on the bus. 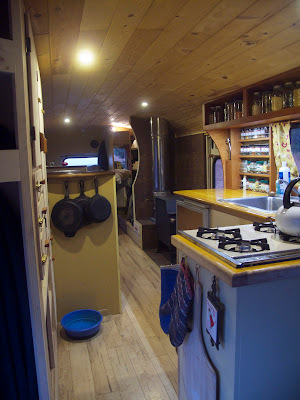 Already we make all of our own bread and yogurt, brew our own beer, cut fire wood, preserve and store local seasonal foods and maintain off grid systems. This past summer we were able to grow the biggest garden we have ever attempted on borrowed land and raise a small flock of chickens for meat. 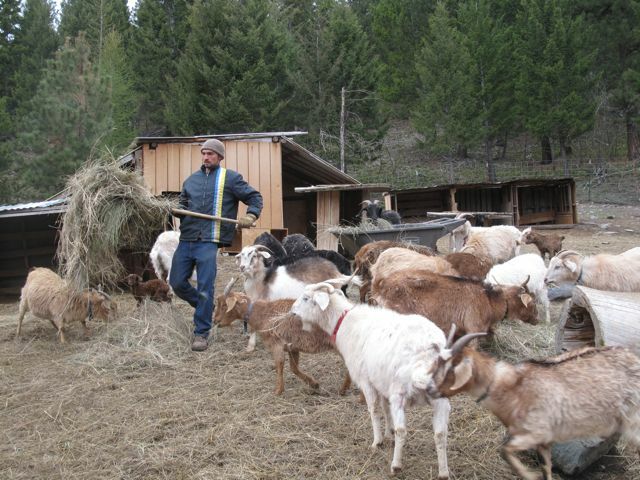 Last winter we learned the ins and outs of raising goats for fiber, meat and milk. Every place we park is a new opportunity. Of course there are multiple blog posts waiting within all of these topics. For now let's just leave it at this. This is where we came from and this is where we're headed. "What a cool idea, but I could never live in such a small space." This is probably one of the most common sentiments we hear. Our living space is exceptionally small by most American standards. The entire inside living area is only 8' by 25'. We recently acquired a small two horse trailer that gives us an additional 5 x 7 feet of storage space. I call it the garage. In 235 sq. ft, we contain ourselves, most of our possessions, our Shepard mutt named Ryder, and our fluffy orange cat, Lemon. By contrast, a 1500 ft2 home is considered quite small in our country. What we have is minimal, but we love it. Everything must have it's place in a small home. Of course there are times when we tire of the odd sort of dance we've developed in order to navigate this space. With one person preparing food, the other filling the water tank and both animals begging for dinner, things can get a little tight. Mostly we've learned to avoid those scenarios so we usually don't feel cramped at all. We have everything we need and everything has its place. We've learned that sacrificing space does not equate to sacrificing quality of life. It has been an amazing learning experience. We didn't know what to expect when we moved on to the bus. We actually thought we were crazy too. 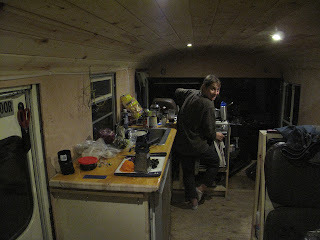 When we started out, the bus was nowhere near finished, actually it still isn't, but the early days were truly minimalistic. The trip from Portland Oregon to an of grid goat farm on an isolated mountain in Kila, Montana launched us from an urban life to the back woods. We arrived armed only with a bed, a sink, a propane stove and two benches. Living out of boxes and a tent that we had erected as a make-shift storage facility, was neither easy nor simple. In retrospect, this experience gave us an abundance of new ideas. We spent hours, days and weeks considering how to design our small home for the most efficient and convenient use of our space. When you are confined, you realize that space is a valuable commodity! We've long felt that "less is more" but now we're learning to do more with less. 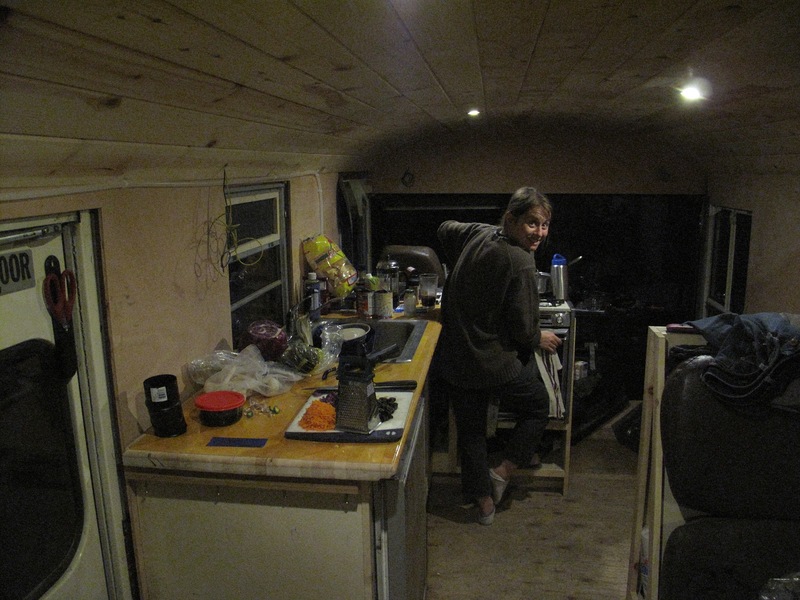 The first dinner in our bus when it was little more than an empty shell. I wont divulge too many of the specifics on how we designed and built our bus, because you can find more info then most would ever want to know by clicking this link: Wild Blue Bus Build (edit 8/13: due to unexplained phenomena, these posts have sadly been deleted by the administrators at skoolie.com) . While you are there, check out some of the other bus projects, or "Skoolies" that people have dreamed up. Instead, let's discuss the virtues of small space living. Topping the list is efficiency. Since we live completely disconnected from the grid, we have become hyper-conscious of our resource consumption. We've been astounded by how little we need to live a fairly normal and completely satisfying life. When water must be carried in 5 gallon containers to fill our holding tank, we do not let the water run continuously while washing the dishes, nor while taking a shower. Our toilet uses a spray type flush instead of gallons of potable water with every use. While the average American uses 80-100 gallons of water each day, our average is closer to 6gallons per person per day. Some adaptation has been required, but it has not been difficult. With electricity, we rely on the sun. Our solar electric capabilities are minimal but provide plenty of power for 8 LED lights, charging our laptop and phones, using small kitchen appliances and power tools occasionally. While we do not have a TV, we can watch movies and programs on the computer and our stereo is on most of the time we are around. The key here is having an accurate monitor. Our batteries, like our water tank, are a reservoir of a precious resource. Leaving lights on in areas that are not in use begins to feel like leaks in the energy tank, which they are. Together, Heidi and I use about 0.17 kWh of electricity per day. The American household average is 31.5 kWh per day. For heat we use wood. Even-though we don't have as much insulation as we would like, it still only takes 3 cords of wood (a couple weekends of labor) to heat our space. We stay very comfortable all winter even when temps drop to single digits. Our small space takes little to illuminate, little to heat and little time to maintain. We can deep clean our home from top to bottom in under two hours! Fire wood to get us through the winter. Please don't take this the wrong way. In no way do I want sound pretentious or to cast a shadow on the way the majority of Americans live. After all, that is the life we had lived until very recently. I share these experiences because I had no idea how much energy I consumed with everyday habits. The simple change of monitoring my consumption and having a small pool to draw from has opened my eyes to a new reality. These are valuable lessons in a world of limited resources. The most important thing I've learned is that it's not that difficult to live a more efficient life. Living in smaller spaces and monitoring resource consumption are great places to start. No, I don't expect everyone to start living in motor homes. Maybe consider an inexpensive watt meter that can tell you how much electricity your appliances use. Or, if you are looking to buy new home reconsider how much space you really need. Small homes are less expensive in every way, and besides that, they are awesome to live in! P.S. The "Follow by email" form on the right is now working. Simply enter your email address and complete the short form that pops up if you would to be notified when we make new blog posts!